A surprise package showed up in the mail recently from my friend Veronica in Kansas. Inside was a bag of black rice, a note, and a recipe for this beautiful soupy pudding. Veronica thought this looked like something I would enjoy, and she was right. I enjoyed this “pudding” so much that I ate part of it for dessert, and the rest for breakfast the next morning all by myself! The recipe comes from The Vegan Lunch Box by Jennifer McCann. I used to own this great little book, but thinned it out of my overflowing cookbook collection a couple years ago and now I want it back! I should never part with a cookbook; it always bites me on the backside later. 1. Place the rice in a 2-quart saucepan. Fill the saucepan with water to within 1 ½ inches from the top. Bring to a boil, then lower the heat and simmer, partially covered, until the rice is tender, about 30 to 40 minutes. Drain the rice and set aside. 2. In a small saucepan, bring the coconut milk to a boil. Add the sugar and salt and boil, stirring, for one minute, until sugar dissolves. 3. To serve, place rice into six dessert cups and top with coconut milk. 4. 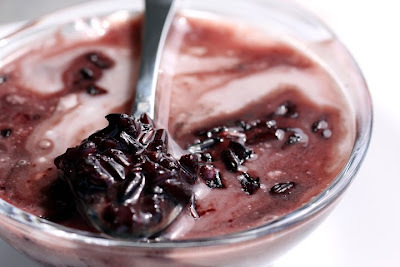 Black rice pudding is good cold or at room temperature, but it’s even better served warm. For lunch, pack the pudding in a lidded container in the lunch box to eat it cold, or pack in a preheated insulated food jar for a luscious hot pudding on a chilly day. Easy enough...and it looks great. I checked out Veronica's blog yesterday and was amazed at how easy this is. Gotta get me some Forbidden rice I see. Questa ricetta è davvero particolare, vorrei provarla quanto prima. I feel sort of evil sending you a recipe I hadn't tried, and I feel a little more evil for not telling you I suspected there were better recipes online. So I'm really glad you liked this version! The one I tried is more thick like regular rice pudding and has a lot more sugar so I imagine it's more of a dessert. This one I think I'd like better for breakfast--I'll try it next. Oh, did you find light coconut milk? I only found regular at the store, but I did buy a brand that had fewer calories than the others (Imperial Dragon). I like this version a lot Veronica because it's very close to my favorite Indian version which is also soupy and sweet. For me, this was perfect. I recently discovered black rice as a gift from a friend too, and I love it. The only downside is that it boiled over as it cooked, spewing blood red ricewater all over my stove. It looked like something grisly had happened in my kitchen the next day! Yikes! I can just imagine black rice blood all over your stove lol. You could have drawn a crime scene around it. I love learning new things too. Oh yeah V, and I found the "lite" coconut milk. We have lots of that here at least. I was just looking at the forbidden rice in the bins at the co-op thinking "what in the world would I do with this?" Weird! Coconut and rice sounds perfect to me! Wow! Have never seen a black rice that was sweet. I think of black squid ink risotto. But this looks intriguing. We had our first taste of forbidden rice in China. I've kept it on my pantry shelf since then. Love your photo and recipe. Fascinating... never saw black rice before. This looks so exotic and fun. I might add some arrowroot powder or agar to thicken it a bit, because that's how I like my pudding and black rice is less glutinous than white. Yumm. I had black (forbidden) rice at a restaurant in Tucson one time and I have never forgotten how much I loved the taste and texture. Alas I cannot find it anyplace and have yet to make it, hopefully I can find some to make this delicious recipe!